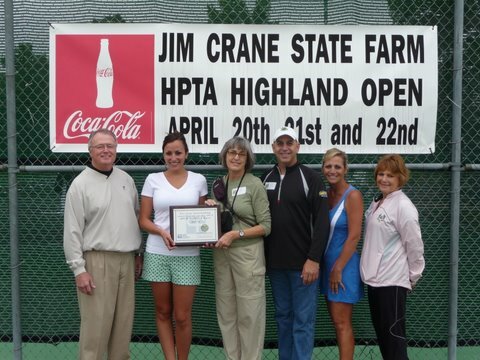 We are very pleased to report that the 2012 Jim Crane State Farm Highland Open Tennis Tournament raised $20,653 for the Cystic Fibrosis Foundation. Of that amount, $8,000 was raised through our “65 Roses” campaign. This year’s contribution to CFF ranks favorably with previous years’ fundraising efforts, with HPTA raising $23,000 in 2011 and $21,500 in 2010. There are few things like the Highland Open that represent the pure goodness and generosity of such a diverse and caring group of people. Whether it’s the players, the tournament committee (HOTT Committee, as they are called), the volunteers, families and friends, everyone pitches in to help raise as much money as possible for the Cystic Fibrosis Foundation. This 30th year of the Highland Open also proved to be one of the best yet with the largest field ever – 126 teams — that never complained after a Friday night and early Saturday rain that caused a three-hour delay throughout Saturday. But, we caught up by Saturday night, and we had a fabulous day of semifinals and finals on Sunday. 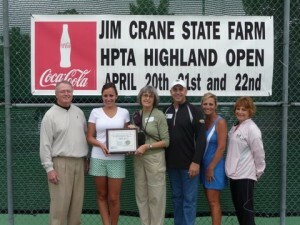 Thanks to everyone who made the 2012 Highland Open a tremendous and meaningful success. Also, check out this very nice video, produced by Jim Crane’s son, Brady. Thank you, Brady! 49. DM Petroleum Operations Company, N.O. 50. DM Petroleum Operations Company, N.O.